The first INI Surf Fest at beautiful Virginia Beach was held on 9/30/2017. We, at the International Neurorehabilitation Institute, are constantly looking for new opportunities to show our patients that life, despite any acquired disabilities, goes on and that NOTHING IS IMPOSSIBLE. “If you can think of a sport, there is a very high chance that it has been adapted”, Dr. Becker says. This clearly applies to surfing. The Surf Fest was held on the beach front of the Wyndam Hotel at VB on Saturday 9/30/2017. More than 30 volunteers and patients gathered under clear blue skies and strong breeze. The patient participants received training on land first before getting into the water. We were thrilled when the VBFD Marine Rescue Team showed up on the beach to secure the waters and add an additional safety layer. From patient surfers to experienced volunteers, we all had a blast! We have attached a few pictures below. We hope to make this an annual event and hopefully it will grow to show even more people that this particular sport of adaptive surfing is available and share the fun with them. We would like to thank all the volunteers and sponsors that helped put together this fabulous event. 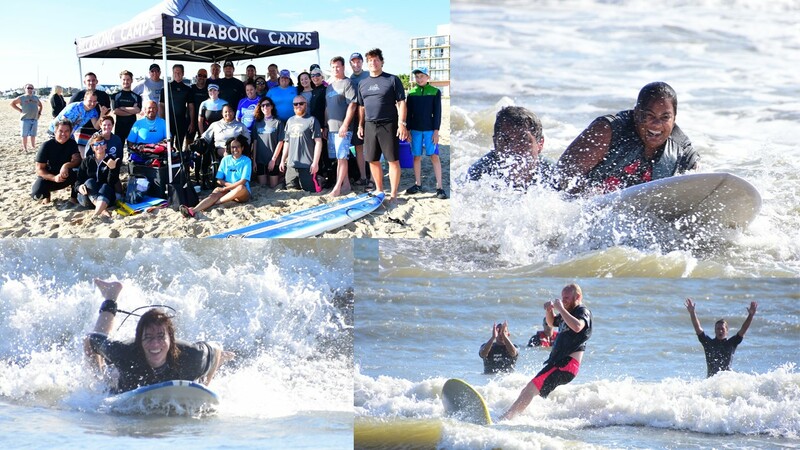 Thank you especially “Team Hoyt Virginia Beach”, Billabong, “Surfers Healing”, “Wahini Surf Club”, the Virginia Beach Fire Department Marine Rescue Team, Cryomax Therapy, and of course our Virginia Beach colleague Barbara Bishop for all of your assistance and support!